Winter fly fishing in Montana is not for everyone. Judging by the numbers of anglers you see in February, it’s not for many people at all. But if you want a world-class trout fishery largely to yourself, don the merino wool and goose down and fish the Bighorn. The water is clear and there’s little algae or aquatic grass. The fish are willing and you can usually fish the best runs in the river with little competition. Water temperatures plummet during the winter months, usually bottoming out around 40 degrees. Cold water affects trout metabolism and where the fish hold. Avoid the fast water, as fish don’t want to buck heavy current. Instead target the medium to slower-current holes and runs. When you hook a fish in this type of water, take your time and work the area well. There are often a number of fish concentrated in the immediate area. Strikes are often very subtle, so set the hook on any quiver or hesitation in your strike indicator. Sowbugs and scuds are a winter standby. These crustaceans are a high-protein food source for trout year-round but become extra important during the winter months due to the scarcity of insect hatches. Instinctively trout seem to know that these little crustaceans contain extra nutrition and they seek them out. I prefer to fish scuds and sowbugs in sizes 16 and 18 but will occasionally fish a size 14 as an attractor for a smaller fly. I need to qualify the “scarcity of insect hatches” statement. I should probably say that hatches are scarce in comparison to summer activity, but they are not nonexistent. Fall Baetis hatches often extend late into November and early December, while midges hatches can be especially prolific in March and April. There is only a short period in the heart of winter where surface action is especially limited. I have experienced good midge hatches on cloudy days in January but you need a relatively wind-free day. Midges seem to take center stage in the winter. Even if the wind is blowing and fish are staying deep, midge pupa are a primary food source. A variety of pupa colors are represented in trout stomach samples, with dark olive and medium brown being particularly abundant. Use pupa patterns with a dark silhouette and you’ll find that the fish are not overly selective as to the exact shade. The Tung Teaser midge pupa in black is a popular winter pattern. When the water is very cold, streamer tactics change. You can catch fish “pounding the banks” in the traditional float fish scenario using a floating line or a 12’ to 15’ sink tip. I tend to use this rig when I’m drifting from run to run, but I don’t expect to rack up huge numbers. With this setup I fish the medium speed or slower water and I don’t fish the fly too fast. Impart some action to the fly immediately after it hits the water, then pause and let the fly sink a bit. An erratic retrieve is always effective, but especially so in winter. The fish often strike on the pause. My favorite winter setup utilizes a heavier sinking line. I sometimes refer to these lines as “full-sinking lines” just to separate the category from the shorter sink-tips, but they are, in fact, 24’ to 30’ sinking-head, shooting lines. The RIO Intouch Outbound Short I/S6 is an example. This line has 30 feet of sinking fly line—sink rate 6 inches per second—backed up by a thin, intermediate running line. The aggressive weight-forward taper of the 30-foot head enables the angler to throw large flies and shoot line with ease. I’m a big fan of the Outbound Short fly lines as I am the Scientific Anglers equivalent, the Sonar Titan Int/Sink 5. Fishing streamer flies in deep water is no longer a chore with these lines. If you had given up on full-sinking lines in the past, I recommend you try one of these new generation lines. You might discover a new passion for winter streamer fishing. Streamer fishing the deep water can be especially productive in winter. I like to anchor my boat on the edge of deep water runs, work the area thoroughly, then pull anchor and move downstream a few feet. I repeat this process until I’ve worked through the best holding water. Two-handed rods, what some refer to as Spey rods, have become increasingly popular on Montana trout rivers over the last ten years. Many of the anglers I know who fish two-handed rods for trout are also steelheaders and they “swing” for trout as a way of preparing for steelhead season. I include myself in this group to some degree, and over the years I’ve used my lightest, summer steelhead rods to swing steamers for trout. Now rod companies, inveterate capitalists that they are, have created a new category of fly rods known as “Trout Spey” or “Micro Spey” rods. These are simply downsized two-handed rods, ranging from 10’ to 11.5’ feet in length, and designed to cast lines in the 2 to 5 weight range. To explain all the tackle and techniques of Trout Spey would require its own article, but the vast majority of the time anglers are using these rods to swing streamers downstream. You can use floating or sink-tip lines as you do this, and smaller, lighter streamer patterns are favored. For example, I’ve had good luck over the years with a Platte River Spider, a brown and yellow pattern that casts easily and has a lot of intrinsic movement. I prefer to fish the shallow to medium-depth riffles and flats with this fly or similar soft-hackle streamer patterns. You can add action to the fly by popping the tip intermittently or even adding a strip or two, but allowing it to swing slow and steady across the current seems to work best. There are days when this technique works exceedingly well. I think fish in very cold water are attracted to something they don’t think is going to escape. A faster, erratic retrieve can sometimes put them off, while prey that moves slow and appears easy to ambush will elicit a strike. Keep in mind that over the course of the year drifting algae or aquatic grass can thwart the efforts of the swing angler. That’s why winter and early spring can be prime time for this method. Lodging is available at the Bighorn Trout Shop throughout the winter and rates are low. Give us a call in the morning (406.666.2375) as our standard hours are 8:00 to 12:00 AM. If you don’t catch us (maybe around Christmas and New Year), leave a message and we’ll call you back. During a normal Montana winter, at least in this part of Montana, we often have periods of mild weather that make for an enjoyable experience on the river. 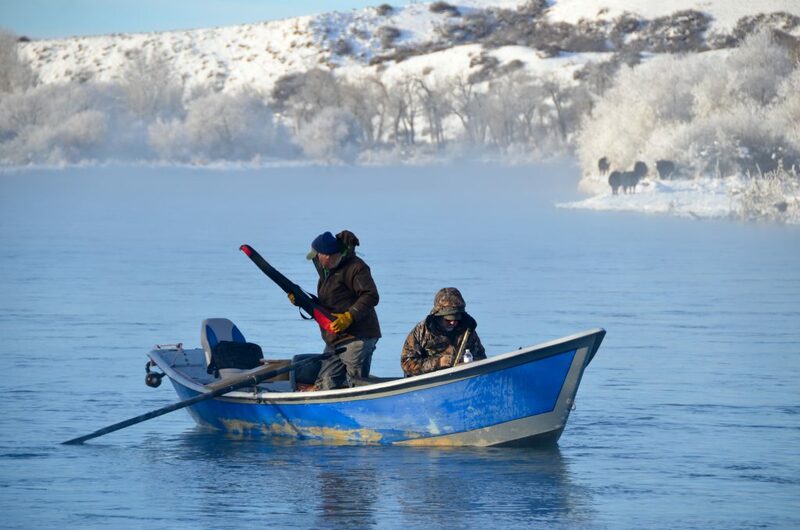 Give winter fishing a try.